This gallery features photos taken with a zoom lens of lightning 25-30 miles away on the evening of September 19, 2008 fron Santa Fe, NM. This gallery features pictures taken the night of February 22, 2008, as a light snow fell in downtown Santa Fe, NM. 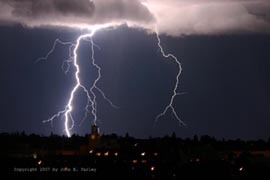 This gallery features lightning from a spectacular storm approaching Santa Fe, NM on August 5, 2007. This gallery features storm clouds illuminated in the bright colors of the setting sun. 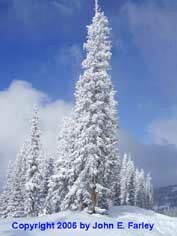 On December 28-30, 2006, northern New Mexico experienced a record snowstorm, with one to three feet of snow commonplace. This gallery shows various photos I took in the deserts and mountains of northern New Mexico in the following days. There is nothing like a good snowstorm to make an already beautiful area even more so! View the incredible beauty that occurs when freezing fog and falling snow occur simultaneously. And it happened in this storm -another major New Mexico storm in mid-January that came on the heels of the one depicted above - in both the mountains and the mesalands/desert to their east. In late November, 2006, I spent three days skiing at Wolf Creek in far southern Colorado. The area lived up to its "most snow in Colorado" reputation, receiving 3 FEET of snow, mostly the first day I was there. That was easily the most I had ever seen fall in one storm. The skiing was tough the first day and photo ops were nil, due to the extremely low visibility. However, both the skiing and photography conditions improved dramatically the next two days. See some of my favorite shots by clicking the link above. When I returned home to Edwardsville, the same storm that produced the snow in Colorado resulted in a devastating ice storm in Edwardsville and throughout much of the St. Louis area. Our power was out for 4 days, and in that amount of time a house can get VERY cold. 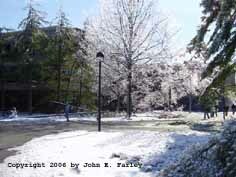 Click the link above to see both the destruction and the beauty of the ice storm. To order any photo, please email John Farley. This page last updated May 5, 2010.